"You really think he's a cute baby?" In response to an email asking how to go about starting a blog, Simon suggested, "tell them to make sure they have a husband and children to exploit." After coming out of a c-section and finding 798 texts from his wife about the state of insanity and chaos ensuing at home Simon responded, "your life is in shambles." After taking a long gander at the scrambled egg, kidney bean, and quinoa creation I was enjoying Simon said, "eating tasteless cattle feed again, I see." While witnessing one of my finer moments as a mother Simon said, "you should really consider writing a book and title it, 'Realistic Parenting: I Give Up'. " In the middle of wrapping up Theo before we put him to bed, "the key to a good swaddle is to make sure the baby's face is a nice shade of blue when you're all finished." After finding Sebastian emptying the trash for a zillionth time in a row and, Simon said, "Julia's kind of trouble takes real finesse and Sebastian's kind of trouble requires a bulldozer." While observing an awake Theo for a few seconds Simon said, "he always looks like he's in search of a French kiss." While talking to me on the phone in the middle of the night about how I was pretty sure I heard a human banging around outside and how disheartening it was that we still had x number of days left in February Simon said, "maybe you should read some Edgar Allen Poe to lift your spirits." You two are less "two peas in a pod" and more "two smart alecks in a loud minivan." Bahahahaha! Kills me EVERY. SINGLE. TIME!!! Yet another confirmation that the name Simon is the perfect choice for our first born son. hahaha i love simon says. the burglar comment is awesome. Oh my gosh! You + Simon = I laugh so hard it's difficult to control my bladder like EVERY DAY. You're hilarious! That burglar bit was the icing on the cake. I laughed out loud at Theo searching for a French kiss! Ha! The French kiss and the burglar - awesome! Oh my gosh you make me laugh! So does Simon have a single brother who shares his sense of humor? Because I need that kind of hilarious in my life. These continue to be my favorite blog posts of the entire internet. I kind of feel like Simon is missing his calling has a blogger. As soon as I saw the title, I decided my late afternoon snack could wait a few more minutes (THAT's saying something!). The burglar comment... LOL! Thanks, Grace (err... Simon?)! These are great! Tell him I do indeed have a husband and children to exploit and fully plan to do so! Thank you for making me laugh!! Simon is a hoot. (And that's a good thing!) And YES, Theo IS cute! Hahahaha!! Basher from the 'Hood....!! BTW I the nurse-midwife swaddle very differently from Dr. Daddy the pediatrician ~ would be fun to see Simon's approach. What can I say besides thanks for the laughs! Oh, it is hard to pick a favorite from this line up, but I'll have to go with: "the key to a good swaddle is to make sure the baby's face is a nice shade of blue when you're all finished." 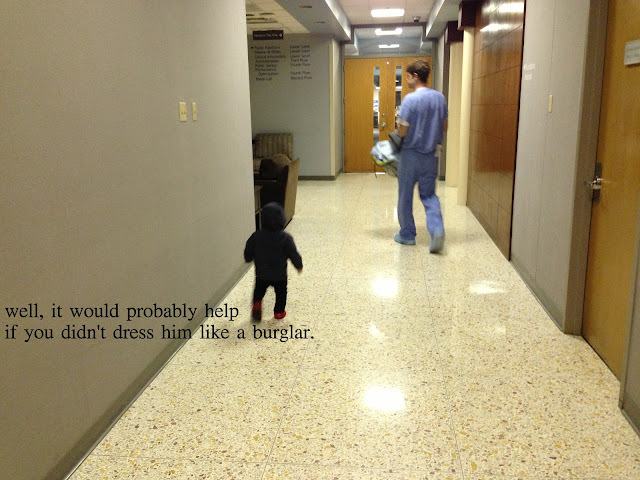 I love the last comment about dressing Basher like a burglar. These posts always make me giggle. Hope you and the kids are hanging in there! Ahh, look at that little burglar! Hilarious! Some of my favorite posts Grace! These are all hilarious!! If pressed, I think I'd say the Edgar Allen Poe bit is my fav. Cutest little burglar in the world! RFLOL!! Thank you for providing this evening entertainment. My hubby really enjoyed the Edgar Allen Poe comment. I of course love your little burglar!! Happy Tuesday!! Literally laughing aloud at every saying of Simon's. I think this may be one of the best ones yet! Btw, glad to see you've eliminated the option of anonymous comments. Opens the door to a lot of obnoxiousness. Your husband is seriously funny! SImon says are some of my favorite posts of yours, hilarious. I wish I had your memory! BAHAHA! The Edgar Allan Poe quote is killing me! So funny. Be honest, does the entire hospital staff rejoice for saving them from monotony every time your crew rolls up in the swagger wagon? I'm guessing yes. LOL! Love the comment about the french kiss...is that your youngest?! I LOVE how my 3 month old daughter always flicks her tongue (especially after she eats!). It does look like she's trying to go in for a kiss!!! lol! You kill me with all this hilarity. Every. Single. Time. I'm so glad I'm not the only one who says "your life is shambles"! I love Simon Says posts! They always bring laughter to my day! Nothing brightens my day like seeing a Simon Says post in my Google Reader! Anyway, please please please write that book. I think it would be a best-seller. Also, Ben and I laughed out loud at the final picture - too funny! Maybe just stick some glow-tape on him? "Meh. This book pretty much sums it up." I love reading your blog. I have my second kidlet on the way and I can already relate to everything you write about. I'm friends with your mom in NM, btw. Anyway, you're hilarious, and these quotes made me laugh. Gabe and I got a good laugh out of this one. And this morning, when he went outside dressed in all black I asked if he was going to rob someone. He said, "Yea, just dressed like a burglar." Your husband's humor is becoming my husband's humor. WEIRD! Bahahaha! I laughed out loud at the French kiss one. I have a ten-month-old, but I can obviously remember those days well enough to know exactly what he means. Your husband's quips remind me of mine. Having a funny husband is the best. I need a better memory to record all the witticisms like you do! I've been a silent stalker on your blog for about a year, and I finally am breaking my silence just to tell you how much I love your posts! I stumbled upon your blog looking for refashioning ideas and have thoroughly enjoyed your views on motherhood, womanhood, etc. The Simon Says posts always make me laugh and as a fellow young mother with three children and a husband in grad school, I love reading that my children aren't the only hellions/angels around...especially at church! Thanks for the glimpse into your life. First time commenter... As you often start your posts with warnings that we should leave immediately (or something like that), I wanted to tell you that I shoulder-shake laugh with tears streaming down as I read your "Simon Says" posts. Thanks!